NEW STAMPING PLATES!! Can you read my excitement?!?!? I love new stamping plates! If I had it my way I would have all the plates ever created. 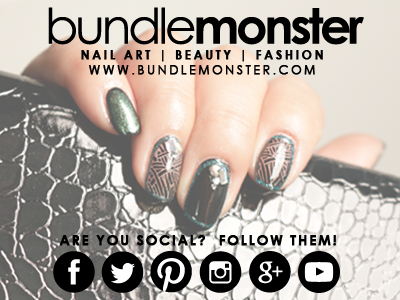 When I found out that Bundle Monster was releasing a new collection I couldn't wait to try them out. The best part was that they are full image plates. There is something about these type of plates that increase my creativity. Saying that, I might have got a little carried away with this review. There were so many images that I wanted to try. 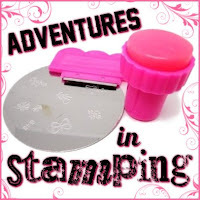 Be prepared for stamping overload! Here is the entire collection. The images on these plates are fantastic! Just as the name suggests, they are full of garden images. They range from flowers to animals and even a little enchanted. I started with two coats of OPI Don't Touch My Tutu. My initial plan was a soft floral design. I used Thanks A Windmillion and images from plates 711 and 718 to apply some vines. They are hard to see in the images but they are there. These thin line images transferred perfectly. There is always that worry that the thin images won't work well but that wasn't the case with here. I used Vant to Bite My Neck, Kiss Me On My Tulips and Toucan Do It If You Try to apply a whole bunch more images. I should have stopped with the second layer but, you know, I though why not. The images came from plates 702, 704, 709, 710, 713, 718 and 724. At least I can say I really tested the plates! As you can see each image transferred perfectly. I had no problems with the etching on the plates and each one was easy to pick up. I can promise you some great plates with fantastic designs. Just don't end up like me and think you have to use them all at once! This set is available at bundlemonster.com for $20.50. You can also buy single plates from the collection for $1.99. I love all the double stamping going on here! You are definitely making me wish I had these plates, I'll have to check them out soon! Really nice stamping plate set this is! You got a pretty manicure with it.